Friday saw the first instalment of Thoughts for the weekend go live, and today we have the first Weekly Roundup. 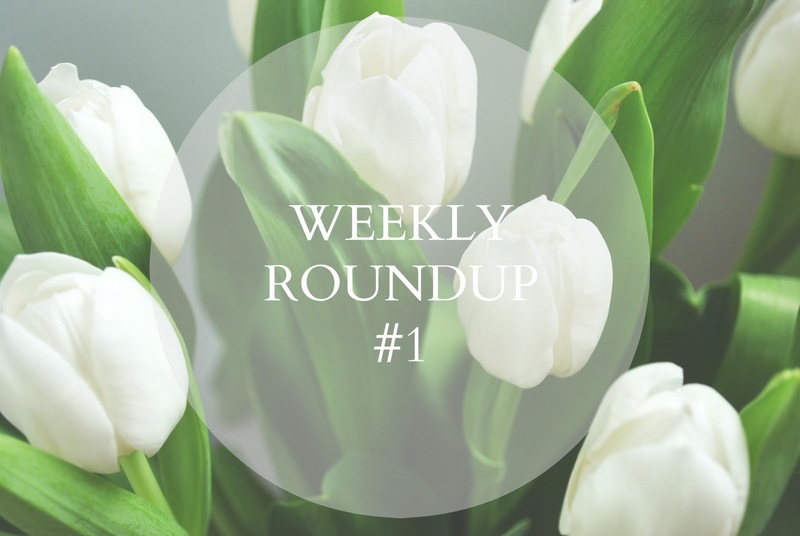 Weekly roundups will be all about sharing the best bits of each week, broken down into the overall highlights, the things and products I've been loving, and blog posts I've enjoyed reading. This week has been a rather lovely one, so I feel like it's the perfect week to start this series with. The past few days have been all about spending quality time with my mum, and we've had the most wonderful time; coffee has been consumed, shops have been browsed, chocolate has been eaten and films have been watched. What more does a girl want? :: The coffee and yogurt with berry compote and granola we both enjoyed on Tuesday afternoon after a quick orthodontist appointment and some perusing of Boots, Zara and H&M. Mum went for a caramel latte, while I went for a cappuccino with plenty of chocolate sprinkled on top. :: Finally finding the perfect colour hair dye for my roots. For so long I've been lusting after beach-y blonde hair à la the likes of the Olsen sisters and Gisele Bundchen, but I've always been scared to dye my roots dark after an incident which left me fully brunette back in 2012, and as a result always choose dyes that are too light and don't give me the look I'm after. But, on Thursday I finally took the plunge and bought a neutral light brown shade, and I love it! :: The lunch we enjoyed at The Belgian Monk, a lovely pub in the artsy end of Norwich with an entire vegan menu, complete with sweet potato fries and raw cheesecakes (which, by the way, are incredible - I'm talking rich, fudgy and dense, but without the heaviness of dairy). Mum and I had the same order; the smoked tofu burger with beef tomato, avocado, salad garnish and sweet potato fries, followed by the 'choco mokka' cheesecake. Totally divine. :: The One Hundred Foot Journey and The Second Best Exotic Marigold Hotel. The former was enjoyed from the comfort of home, accompanied by homemade sweet potato and chickpea curry and onion bhajis, and the latter at the cinema, with some tasty snacks from Holland & Barrett. I love a good feel-good film, and these two fit the bill perfectly. :: The Lindt bunny Mum kindly gave me as an early Easter present. I love a bit of dark chocolate (lately it has been part of my daily diet), so a bunny-shaped offering couldn't not be a highlight of my week. :: Eyelash curlers. During my younger adolescent years I was an avid eyelash curler user, but they slowly became less and less a part of my routine, and eventually became obsolete in it. But now the days are getting brighter my makeup is getting lighter, and I felt that my lashes needed that extra boost, especially on those no-eyeliner days. So, on Thursday I picked up an eyelash curler from Boots, and I'm so glad I did - it's such a simple step, but it can make such a difference. :: John Freida's Frizz-Ease shampoo. I've been using the same shampoo and conditioner for a good few months now, but after feeling dissatisfied with the fluffy, frizzy state of my hair for the past few weeks, I decided to try something new upon Mum's recommendation, and purchased a bottle each of the Frizz-Ease shampoo and conditioner. Although it's early days, so far so good, and what's more is John Freida products aren't tested on animals. Hurray! :: Rosie's roundup of the ten things that have made her happy this week. Rosie's '10 things' posts acted as one of the main inspirations for this series, and each week I look forward to catching up on the goings-on in Rosie's life and seeing what her favourite moments have been; there's something so wonderful and inspiring about finding the lovely things in every week and compiling them into a list, no matter how good or bad your week has been, and it's something I'd quite like to start doing myself. :: Anya's DIY teacup planters post. I'm totally with Anya when it comes to her love of houseplants, especially cacti and succulents (which is handy seeing as I've yet to successfully keep a houseplant other than my [low maintenance] baby cactus), and I think teacups make the cutest plant pots! My cactus may have to move home into a vintage teacup some time soon. :: 5 ways to look and feel more confident on The Nectar Collective. Confidence is something that can desert me during the times I need it the most, so the tips given in this post are definitely ones I will keep in mind and refer back to during those times. :: Polly's Instagram catch up. I only recently discovered Polly's blog, and I loved her 'Recently on Instagram' post this week; smoothies, pretty packaging, an outdoor cinema trip and a beautiful sunset complete with outdoor string lights? Sounds like a perfect week to me! :: Kelly Krause's post on Camille Styles about staying healthy when you have a busy schedule. Lately I've been trying to get back into a fitness routine after a couple of months of a great deal more inactivity than I would like, and I found Kelly's post really motivating and inspiring; your health and fitness doesn't have to suffer when you're busy and/or away from home; all it takes is a little planning and preparation. Those have been the highlights of this week, and I hope you've enjoyed reading about them. What have the highlights of your week been?